Qualified staff conduct pre-booked group tours (minimum 10 people) both through the Daintree Discovery Centre and the local environs. The Centre is renowned for its excellent boardwalk tours and expert tour guides. 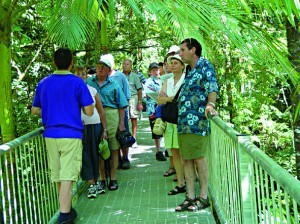 To ensure the Daintree Discovery Centre experience is top quality, the maximum numbers per guide is 20 people. The Centre has the capacity to cater for group of 100+ at any given time and still provide an unforgettable rainforest experience. With the appropriate notice, experienced staff will design a unique program of events to suit your specific needs – and in particular, the needs of specialty groups visiting the Daintree Rainforest. Group visits vary according to the needs, interests and time constraints of those involved. While the average commerccial tour group tends to spend approximatedly one hour at the Centre, the time varies enormously. For instance, those who want to focus on the Canopy Tower might spend as little as 30-40mins, while other special interest groups, international students or visiting research personnel often prefer to spend the whole day exploring various aspects of the rainforest. The Centre has also been involved in a successful exchange program with US College students who use the Discovery Centre as their study base whilst in the Daintree area. Such groups often spend a week or more at a time – interacting with visitors to the region, gathering rainforest data and generally tapping into the wealth of expertise available from the staff and management of the Discovery Centre. The Centre is an ideal venue for a wide range of visitors from various social and cultural backgrounds. It is extremely popular with overseas visitors – especially people from non – English speaking backgrounds. Daintree Rainforest Self-guided Audio tours are available in 8 languages. Most tour groups tend to choose one of the following options. However, such choices are flexible and can be tailored to suit the needs of your particular group. Option 1: Our ‘Standard Service ‘for regular commercial clients and charter groups includes morning/afternoon tea followed by a comprehensive and highly entertaining guided tour of the Aerial Walkway, Cassowary Circuit, Bush Tucker Trail or the Canopy Tower. Such groups also have full use of all interpretive facilities, theatre and the Display Centre – a definite bonus in inclement weather! Option 2: A deluxe morning/afternoon tea service is also available to regular commercial clients and specialty charer groups. This service includes the use of our boutique cafe area and the provision of a more úp-market’morning/afternoon tea followed by our comprehensive and entertaining gided tour. Such groups also have full use of all interpretive facilities, theatre and the Display Centre. Option 3: A self guided tour of the Centre conducted by your own guide/coach captain and full use of all interpretive facilities, theatre and the Display Centre. We can provide morning/afternoon tea, or alternatively you may choose to provide your own refreshments. Option 4: Any of the above with a 48 page interpretive guide book provided at cost. Option 5: Entry only – visitors buy their own refreshments and interpretive booklet if they wish. Note: In each of the above mentioned options, morning/afternoon tea for your drivers is free of charge!